It is with a hearty nod of appreciation to Yorkshire’s Oldest Brewery that Pike Brewing Company introduces our winter seasonal, Pike Organic Double Oatmeal Stout. Certain beers embody and capture a beer style more than any other. 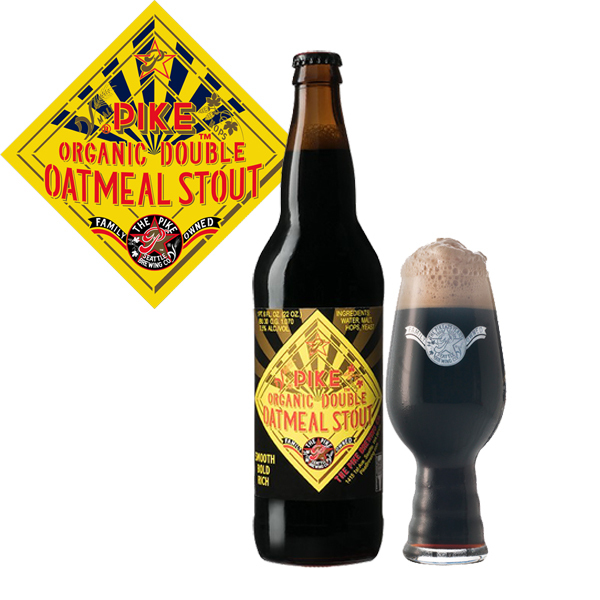 When it comes to oatmeal stout, the beer that sets the standard is Samuel Smith’s Oatmeal Stout. This world classic has a long relationship with Pike Brewing Company since Pike founder, Charles Finkel, conceived the idea of reviving a classic, yet extinct, beer style. He introduced the idea to Samuel Smith for which he was the importer and then worked alongside their Head Brewer, Allister Ross, to arrive at the color and taste. Charles designed the logo and label that adorns the bottles and introduced the beer in the U.S. in the late 1970s. Pike Head Brewer, Art Dixon, sought to mirror all the characteristics that drew him to this Smith’s oatmeal stout, such as its silky mouthfeel, warm chocolate tones and roastiness, and then take it up a notch with this organic double. Always interested in the details that can set a beer apart, Art took extra care in selecting a unique blend of 6 malted barleys and rounding them out with organic oats. He then added his west coast style to the brew with a late addition of Willamette hops, a relation to England’s famed Fuggle hops. Pike Organic Double Oatmeal Stout is dark and incredibly smooth. The beer’s inviting malt aromas bring you into a silky and round mouthfeel and chocolate, roasty and caramel flavors. It is available now on draft and in 22 oz. dinner bottles.